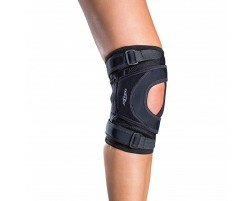 Knee braces can help prevent or reduce the symptoms of Runner’s Knee and patellofemoral pain (PFPS). Runner’s knee often occurs due to a muscle imbalance, overuse, misalignment and more. Pain is usually felt under or around the knee cap especially when you bend your knees, walk/run, or use the stairs. Our bracing experts recommend the following braces for Runner’s Knee or Patellofemoral Pain which you can wear daily or during your next run to support your knee. 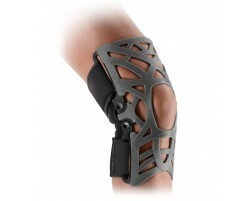 Need help selecting a brace for runner's knee? Use our guided tool, Brace Advisor, for recommendations based on the ideal runner's knee brace for you based on your level of activity and usage. Runner’s knee also known as Patellofemoral Pain Syndrome (PFPS) is a common ailment among runners but can also affect individuals involved in activities that require a lot of bending of the knee. It often affects young, otherwise health athletes. A few ways to prevent Runner’s Knee include increasing mileage slowly for beginner runners training for their first race, focusing on building strength in the quads, hips, and glutes, ensure you have proper arch support, run on soft surfaces like dirt, trail or grass instead of sidewalks or asphalt, and wearing a knee brace to help support the patella. The best way to treat runner’s knee is to rest as soon as you feel any pain with special attention to avoid weight-bearing exercises. Icing your knee if you feel pain and after workouts can help reduce inflammation, pain and swelling. Compression is key to giving your knee the added support you need. A compression knee sleeve is perfect in this case. If you do continue to participate in activity or feel pain through daily movement, wear a recommend knee brace specific for supporting runner’s knee. If your knee pain does not go away, seek a physician or physical therapist who may recommend a strength program and stretching exercises to help you cure runner’s knee. The best low-profile brace for Runner’s Knee is our DonJoy Performance Webtech Strap and our DonJoy Cross Strap which applies pressure on the patellar tendon to help relieve pain. Need more help? 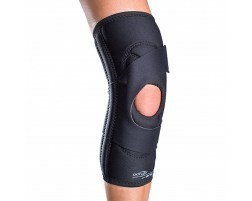 Find out which type of runner's knee brace is right for you.